At embedded world, 23rd-25th February, Semtech Corporation will demonstrate a LoRaWAN Internet of Things (IoT) network deployed by Digimondo, a subsidiary of E.ON. Digimondo launched low power wide area networks (LPWAN) over Nuremburg, Hamburg and Berlin and will demonstrate the Nuremburg network performance during the tradeshow. The company will achieve this by wirelessly tracking public transportation vehicles across the city. The vehicles’ movement will be displayed on a monitor at the Semtech (2-631) and Microchip (1-510) booths. 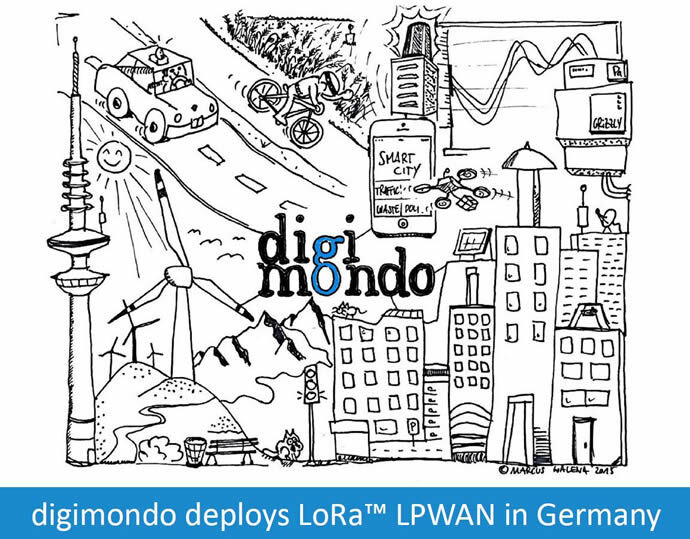 Digimondo, started by E.ON in June 2015 to help digitalise the German energy industry, intends to launch an open LPWAN based on the LoRaWAN standardised specification that will enable IoT applications, such as public transportation tracking, smart metering, air pollution measurement, boat tracking and more. The network infrastructure, which was tested in Hamburg and Berlin in 2015, has been approved for further deployments in Munich, Frankfurt, Stuttgart, Düsseldorf, Essen, Cologne, as well as rural areas where volumes are secured. The network is expected to be open to outside enterprises by mid-2016. In addition to the demo, Microchip, a member of the LoRa Alliance, www.lora-alliance.org, will be giving away LoRa-based development kits connected to the Digimondo network during the Embedded World exhibition so attendees can evaluate the network’s performance. Development kits will be available on a first-come, first-served basis to select clients at Microchip’s booth 1-510. Both Digimondo’s network and Microchip’s development kit are equipped with Semtech LoRa RF technology, which was developed to enable LPWANs and IoT applications. LoRa technology offers increased range, battery life, penetrability and connectivity, and it has been implemented in a wide range of LPWAN and application deployments worldwide. LoRa technology is being used for agriculture monitoring, public safety, building and infrastructure management, water conservation, natural disaster tracking and more.